All photos are copyright 2008 by Patrick Sun. Unauthorized use without written consent is prohibited. 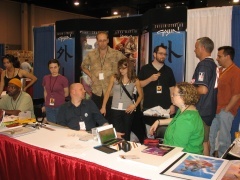 Heroes Con typically takes place in Charlotte, NC, on Father's Day weekend at the Charlotte Convention Center downtown, and this year it took place a week later. 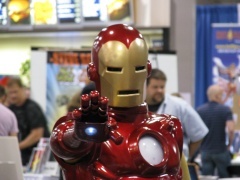 Heroes Con is a nice friendly place to take the whole family to enjoy comics, etc. This year I made an effort to take even more photos, and so I did. This year's photo album has over 1100 photos. By uploading the photos to Flickr, I could maintain the original resolution, 2592x1944, and Flickr then allows the viewer to pick out various sizes for each photo if they want to see a smaller size, or the max size. I tried getting most of the guests at their tables, so it probably seems like I am not all that discriminating judging by the number of photos this year... This year I am using the Canon A610 digital camera for the close to medium shots, and my new Canon S5 IS digital camera for the long-range shots (like in the art auctions on Friday and Saturday). 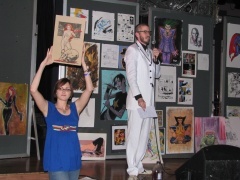 Also, the art auction photos vary in quality due to lighting conditions. On Friday, my friend Patrick and I got into Charlotte around 2 p.m., but spent half an hour fruitlessly looking for a parking spot in the Hilton hotel parking deck until we gave up and went for the valet parking. Finally picked up our badges and made our way to the Gaijin booth and noticed Brian Stelfreeze's line was relatively short, so we waited for Brian to grace our sketchbooks with one of his fine sketches, and I was grateful for the sketch of Oracle that Brian did for me. We walked around, getting a feel for where everyone was situated. Did swing by the DC Nation panel, but wasn't too interested with the discussion at hand, so I checked out the silver age panel, but soon left that panel as well. I wasn't all that interested in the panel line-up this year, so I didn't check out any other panel for the rest of the weekend. Spent the rest of the afternoon checking out the pieces being created for the Art Auction on Saturday, and also catching up with friends from past Heroes Cons. Connected with Brian, who finally made it to the convention, and we checked out Fuel after the floor was closed, and got some pizza, and then checked out the Mike Wieringo Art Auction and Tribute, which featured many of 'Ringo's friends sharing their appreciation of their friendship with him. Saturday came soon enough, and it's aways the busiest day of the convention. We got up and wait in line for the opening, and waited an hour for the turnstiles to open, mainly to get a shot at a sketch by Steve Epting, who was only going to be at the con on Saturday, so we waited and waited, and then got moved to the Heroes Initiative booth where Epting was scheduled for an autograph session, and then we got moved back to Epting's table, and waited some more until we finally got our sketches. Patrick's sketch of Sharon Carter got screwed up with the last marker stroke, and that was a disappointment for him. My sketch of Black Widow ended up "normal", so I lucked out. I was able to bounce around the floor as Patrick held my place in the Epting line, which ended up being around 5 hours or so of waiting. I hope I don't do that much anymore in the future. Since Matt Fraction was sitting next to Epting's table, I ended up buying the 2 hardcovers for Immortal Iron Fist and had Fraction sign both of them for me while waiting on Epting's line to diminish. I also stood in line for the mega-autograph session for the Mike Wieringo What If issue, and finally got my issue signed by 12 people who chipped in to complete the story for publication. 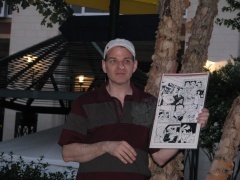 I also picked up the Darwyn Cooke signed/numbered print that you get for early registration. I also spent most of Saturday checking the progress of the art pieces that a few of the artists were creating for the annual art auction later that evening at a new venue, the Alley Cat, a spot that was 5 blocks away from the convention center. Also caught up with Kevin, and he had his friends with him as well, so we made some new friends this year. I took lots of photos, and then met up with Patrick, Brian and Kevin to go to the Art Auction. Unfortunately, the weather took a turn for the worse and began to rain very hard as we walked through the labyrinth of buildings and crossways between buildings to avoid the rain, but the final 40-60 yards required us to run through the heavy rain, which we did, and we got soaked. The Alley Cat was probably a little too small of a venue to host an art auction, but it went on as planned, with Dustin Harbin as the M.C. We didn't get seats until 2/3 into the auction when people finally started to leave as the number of available pieces dwindled. The new big kahuna was Stephane Roux, whose Poison Ivy/Harley Quinn piece garnered the high bid of $3800, and we had some other pieces by Cat Stagg and Sarah Wilkinson nab final bids in the neighborhood of $1500 (or higher, I can't remember anymore). I think pieces by Brian Stelfreeze, Phil Noto, Craig Hamilton also got bids around $1000-$1100 each. After the auction, we went to Merts for dinner, and I was pretty disappointed with the super-tough plate of beef ribs that I was served. After that not-so-great meal (for me), Brian and Patrick retired for the evening, and I hung out with Kevin, and met up with his friends at the Hilton and we made our way to the Westin and just hung out and talked to some folks for a while until it got late and we finally retired as well. Sunday was a little less busy, but I only ended up buying a couple of hardcovers,and didn't even do a lot of digging through the cheap bins for back issues I was looking for, I guess I was just too tired at the time. I did more snapping of photos, tried to get one shot of every table that was set up at the convention. That was kind of fun as Kevin was hanging with me. Kevin also turned me on to an artist by the name of Chris Samnee who does some really nice artwork, and I commissioned a 2-character piece from him, and asked him to do Oracle and Black Canary (in the fishnet costume), and I was rather pleased with the piece. Kevin took off for home in the middle of the afternoon, and Brian showed up, so we did some more browsing of the show until he needed to take off for home as well. Finally found Patrick, and hung around Jeff Parker's table as the show winded down. Snapped some photos of Brian Stelfreeze as he finished a sweet water color of the Night Nurse, and he was conducting a mini-seminar in comic page layout philosophy in terms of how to heighten the storytelling aspect of laying out the page to move the plot along, and not just draw pretty cool panels. Dustin was nice enough to give me an invite to the Dead Dog party (the after show party at the main Heroes store for the pro's in attendance this weekend), and it was an interesting time. They fed us BBQ and pizza, and beer. The rain returned for another engagement on Sunday evening, so getting back to the hotel required waiting out the rain. The highlight was getting to see Frank Cho do a sweet sketch of Wonder Woman for Linda, Shelton's lady, and it was an unexpected treat because Frank rarely does sketches at conventions anymore. The party wound down, the rain finally quit raining, and it was time for us to be shuttled back to the Hilton. Where does the time go when you go to Heroes Con, I wish I knew, but it's always an interesting time. 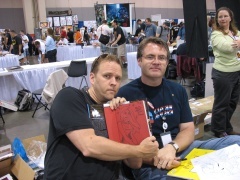 My Heroes Con 2006 Photo album. My Heroes Con 2007 Photo album. My Dragon Con 2006 Photo Album. My Dragon Con 2007 Photo Album. So how many have visited since 06-25-2008?